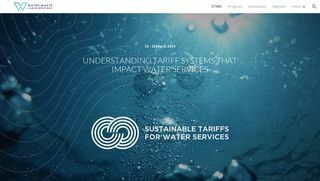 The conference aims to promote an interdisciplinary dialogue on the sustainability of water services tariffs, under different financial, environmental and social perspectives, including the legal and socio-economic aspects of their implementation. The design and setting of tariffs intend to achieve several objectives that sometimes conflict with each other and are even incompatible. In addition, the form and structure of how the tariff systems are used do matter and can make a difference. In this way, the setting of sustainable tariffs for water services is a challenge, both in Portugal and internationally. Also, new and recent problems make the design of tariff sustainability more demanding and complex. Climate change and the need for more resilient systems, new sources of water, such as those resulting from reuse, desalination and also rainwater, raise new issues that need to be discussed and analyzed for the implementation of best practices. The fact that the access to water is considered a human right also strengthens the social component of sustainability, which can never be separated from financial sustainability. All these issues require adequate governance for the different countries to achieve the sustainable development goal (SDG), in particular the goal number 6, in a context and great pressure. For this purpose, the adoption of sustainable tariffs becomes fundamental and is of the utmost importance.